Sandwiches are not my favorite food, I very rarely eat sandwiches, almost never…but on Sundays I sometimes go to “Le Garage” in Sausalito for brunch (a little touristy town across the Golden Gate bridge), it’s a really cute French restaurant that serves good brunches, fresh, seasonal products and with a gorgeous view of the Bay, so all reasons combined to make it a great place for brunch. Last time I had brunch there, I tried their Pan Bagnat, a typical sandwich from Nice, just because I had already tried everything on their menu and I was starving (that’s when I can appreciate a sandwich). I never order sandwiches in a restaurant, not because I am a snob or picky, just because I really don’t like to eat that much bread at once, it’s that simple. Besides, for me sandwich is something you eat “sur le pouce” (on the thumb) meaning on the go, you grab it and leave or they’re great for picnic but I don’t like to sit down in a restaurant to eat a sandwich. Anyway to cut it short, one Sunday Pan Bagnat and myself met again after such a very long time that I had almost forgotten its existence and we fell in love over again. 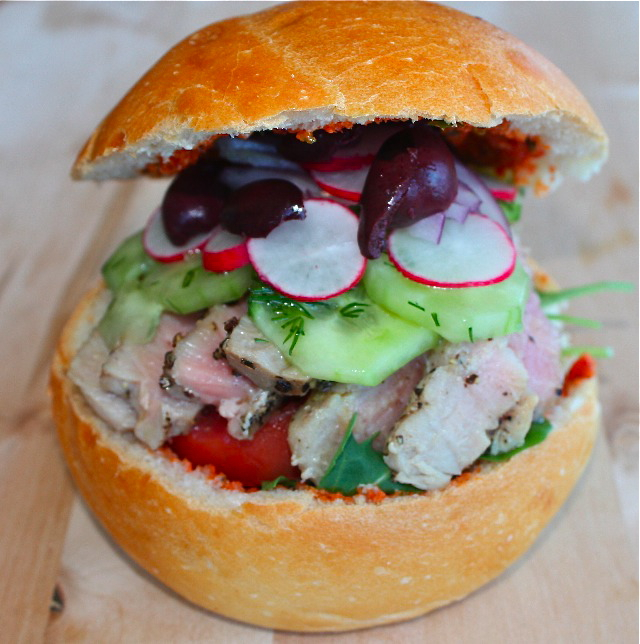 Pan Bagnat, in dialect from Nice (Pain baigné = wet bread) is made with salad, tomatoes, cucumbers, sliced eggs, tuna, olives niçoises (also sometimes anchovies are used) and lots of olive oil (that’s where its name comes from, wet in olive oil). You can use green peppers, and basil as well. The bread used is a special round bread that is opened, with the white part of the bread removed (I have just learned that technically in proper English it’s called crumb – no S). The composition of Pan Bagnat is very similar to salade niçoise, and using local ingredients from Nice. The round bread is soaking in vinegar, olive oil to make it softer and then filled with those ingredients. Every bakery in Nice sells those but you can find it in other regions as well. My Pan Bagnat has been a little modified from its original recipe, for the purists, please forgive my audacity to call it Pan Bagnat…Instead of canned tuna I used fresh ahi tuna grilled coated with coarse black pepper and some bell pepper paste as a spread. Cut the roll in two, still leaving the bottom portion bigger than the top. Remove some of the white part of the bread from bottom side. First start preparing the spread. Place roasted pepper in a mixer, then add basil, garlic, basil, walnuts, olive oil and salt. Mix to obtain a smooth paste. Adjust with salt if necessary. Set aside in an airtight container and place in the refrigerator. Crush black pepper in a mortar or you can also use a pepper grinder that grinds coarsely. Place pepper in a flat surface or a plate. Add kosher salt to both sides of the tuna and press tuna firmly on top of pepper to coat both sides. Grill tuna under broiler or on a grill on both sides for 3 minutes each sides or until the outside is cooked but still rosy in the middle. Do not overcook, leave the center of the tuna rare. When cooked remove from the oven or grill, and slice in small strips. Using your hand squeeze firmly cucumber slices to remove excess water, add a little olive oil, dill and salt. Spread 1 tbs of the roasted pepper pesto on each sides of bread. Place arugula, tomatoes, egg, tuna strips, cucumbers, onion, capers, radishes and olives. Drizzle with extra olive oil, a little wine vinegar. Press firmly and serve. This entry was posted by silvia on October 8, 2009 at 10:04 pm, and is filed under Express - Less than 30 minutes, Fish/Seafood. Follow any responses to this post through RSS 2.0.You can leave a response or trackback from your own site. looks utterly exciting. I can imagine all the lovely flavour bursting in my mouth when I bite into it. I wonder if that sandwich would fit in my mouth but I love the flavors of this Pan Bagnat Sandwich. I’m now craving for this right now. I love a sandwich on a weekend afternoon, mmm. This looks so delicious and pretty. It’s so interesting – having just posted about banh mi and now looking at this photo of the pan bagnat, you can really see the French influence on the Vietnamese sandwich. Again, your refreshing and bright foods make me long for a forever summer! I also tend not to eat many sandwiches, only because of the bread, but everything in here is so good, I’d just make it as a salad! sandwiches are my fiance’s favorite food, so i’m always looking for new things to put between slices of bread. i’ll have to show him this one and see what he thinks. this is a beautiful sandwich – i can taste it already! Looks so healthy and a nice big serve too. that looks great! i love pan bagnat and haven’t had it since i was in Nice.